Another TNNA market is behind us! I had a few bumps in returning this year. First of all our hotel had no electricity all night the night before I had to leave- they did notify us but darkness is darkness. I didn't really pay that much attention to the notice. I forgot I had a 4am call. Anyway alarm goes off on phone - there I am in total darkness. So I dress in the dark and then open the room door to let the hallway emergency light in. Luckily I had packed the night before. And also blessedly lucky that the elevators were working! So finally head out and get in a cab. Halfway to the airport - no eyeglasses! Have to turn around and go back to hotel. No one has a flash light but they give me a glow stick! (You are never too old for new experiences!). So me and my handy glow stick - which I have never used before - head to my room to locate my glasses - in the dark. Of course they are not on the nightstand where I thought I put them. Well, I had but I also had knocked them off onto the floor when packing my cPap. No matter - I found them and off we go again. Get to the airport - very inconsiderate and unfriendly taxi driver. Go drop off luggage. Have wheelchair transport through airport. Get up to security - won't let me go through. My drivers license expired in August. Now, why did they let me come to CA with an expired drivers license but would not let me come home on it? Do I have another photo ID? Of course not. Do I have my passport with me? Of course not. So the young man informs me he has to call his supervisor and they pull me out of line. While waiting for the supervisor the young lady handling my wheelchair said 'Ma'am do you have a Costco card?" I said yes but I don't normally travel with it but I will check. The gods were smiling down on me because I did have it with me. Supervisor arrives and after much paperwork they decide to let me board my plane. Then in Dallas Fort Worth, my wheelchair lady was so slow it was tempting to tell her to sit in the chair and let me push. We get to the gate and they have already made the final call. The terminal door was closed but the plane door was not. I think they let me on because the sky cabs have to enter passenger pick up, etc in their iPad so I am assuming they knew I was on my way and dependent on their staff. Anyway another disaster averted. So happily I made it home safe and sound. And, can you guess what the first thing is that I was going to do the next day? You got it! I was at the Dept. of Motor Vehicles when they open! And I will always travel with my Passport as well from now on too! Lots and lots of interest in the three new Online Mystery Classes that I have added for 2018. The Moon Grazer is tentatively scheduled around the first of the year. The Steampunk Witch is set as a class but the date is still kinda fiddlely! The notification list is growing daily! These lessons may well be posted every other month instead of every month. We'll see how things progress along those lines. 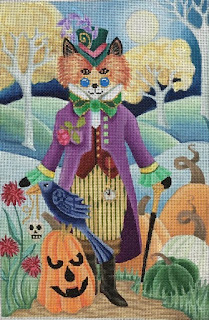 Also on board is the cute, cute piece from a new designer for our Online Mystery Classes - Love You More. 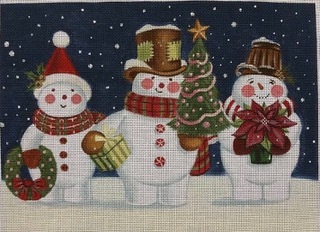 Aren't these snow-people just the cutest? They are going to be a lot of fun! 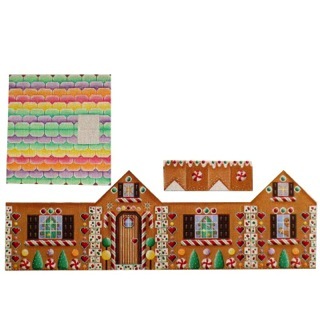 The design area is approximately 9" x 11.5". Just email me at duodesignsinc@yahoo.com if you would like your name added to any of the above notification lists. This class will probably be early 2018 - gets earlier and earlier the more I play with it. Finalizing kit preparation for my classes at the Blue Bonnet Retreat! This is always a wonderful retreat and although working it is also relaxing! Looking forward to it! 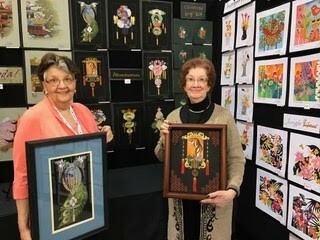 I am teaching two of Juli Poitras of JP Needlepoint . Her delightful Black Beak Hooter and the regal The Black Queen! 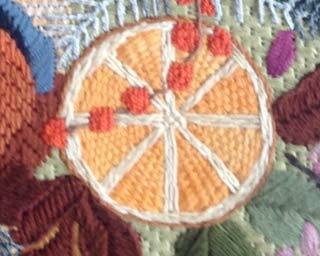 Have a great week - email with any questions to duodesignsinc@yahoo.com - and remember to stitch with a smile! TNNA WINTER MARKET IN FULL SWING! I am in San Jose at the TNNA Winter Market. I taught this cute Noahs' Tooth Fairy Ark from Brenda Stofft to the shop owners that attended. Be sure to have your shop owner contact Brenda to get yours. 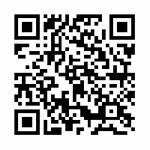 There is also a stitch guide available. In the meanwhile, I almost missed the deadline for class proposals for the ANG DC Seminar! Good thing I had done most of the work at home before I left. Luckily I ran across Lisa Crespo and Catherine McEnerney from ANG who 'gently' reminded me. Keep your fingers crossed that they might pick something so I can share it with you. Today is first day of Market so I am going to be off as soon as it opens. I return home tomorrow. Yep. It is official. Brenda Stofft hates me! I told her that she hates me! She will let me get no peace! About the time I settle in she comes along with something that I simply cannot pass up! And, as if that is not bad enough, I have been 'recruited' to add yet another Brenda Stofft piece to the lineup. One of our first Online Mystery Classes for 2018 will be the new fabulous Moon Gazer. The sweet creature is from a new addition to Brenda's line from artist Amanda Clark. The design area is 7" x 16.5" on 18 ct canvas. Oh WOW! My head is already churning. Let me know if you are interested in being placed on the notification list! You know the drill - just send me your email address at duodesignsinc@yahoo.com and we will add you to receive notifications concerning this design. 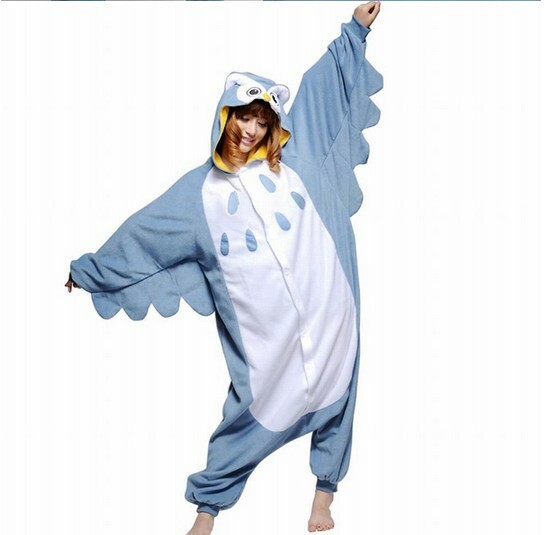 Here's a picture of Brenda herself modeling it for us so I could show you the size better. Had a fantastic dinner last night with friends Robert and Leigh Richardson of Leigh's Designs - and she debuted her new Illuminaion Series. Here we are with my piece - the Gateway to Paradise Peacock and Leigh with Jane Woods' magnificent tiger piece. Now I am off to dinner with the fantastic Cassie Prescott and Nandra of Sundance - Italian food - yeah! And they introduced the glow in the dark beads at market today - can't wait to get them on one of those Brenda Stofft pieces! It was great seeing friends again - Amy Bunger and Jill, Kathy Balthrop from The Stitching Studio of Richmond, Joyce Gresh from Osterville, Kim Walton of the collection, Robbyn Neese, Melissa Prince, Jim and Terry Collingham and working with their wonderful daughter-in-law Briana, Nancy Laux and Saira both of Houston, Jane Garrison of Theadnuts, Doug and Dena of Kreinik, Sally (my right hand man) of Rainbow Gallery, Susan Roberts' bunch, Hyla Hurley and her cute stuff, visiting with Kate Dickerson discussing our upcoming trip to Italy, the girls at Puffin, Raymond Crawford educating me on flora, seeing Lisa again (formerly Nashville Needleworks) helping her sister Emily with her booth, Juli and Pete and getting the owls ready to head to Austin for Blue Bonnet Retreat, Karen at Vineyard Silk, an on and on - oh such fun. This is what market is about to me - see friend once again. We missed those who could not attend this year but hopefully our paths will cross again soon - maybe next market. So have 4 am wakeup in the morning to head back home - I am ready although I will miss the second day of market. The New Year of stitching has begun! 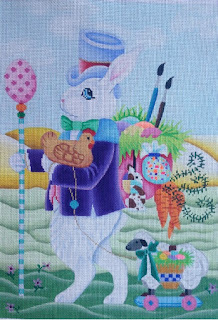 Tomorrow (if I can manage to hold off that long) we will post our first lesson in our Online Mystery Classes on a brand new project the Large Easter Rabbit from Brenda Stofft! As I generally do, we will start with the sky and then come forward. Additionally, we'll be gearing up to post lessons for another newbie - a squeeze into the schedule - the funky Steampunk Fox! He, too, is from Brenda Stofft. He'll make his debut on February 15. And we will continue in our series of the Pillow Collage, Robins Wreath and Santa's Rewards. CUPCAKE CLASS ALERT! Our canvas is a special paint contract and is larger than the one normally seen so be sure to get the proper canvas if ordering through your local needlepoint shop! In the background, as we can work in a few hours here and there, we are busily kitting up surprises for our wonderful Needles 'N Fins activities. Our land tour for the Boston/Cape Cod area Have a Ball in Boston needs some help. If we do not get enough participants to meet the agency's minimum then it may become just a dream. But we are optimistically working ahead on the fantastic class that we will get to do as an exclusive debut when staying in Cape Cod. 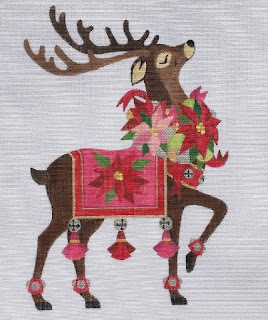 This is a design from Osterville Needlepoint! Wait until you see what we do to those shells - and those flip flops - and, - and, - and. Party on the Po, riverboat stitching cruise on the Po River in Italy, on the other hand, is holding its own. We are still having people inquire regularly and signing up at a good pace. One more laid the money on the line, so to speak this week, and four more are at the door wanting to try and take advantage of the early bird booking discount! So, my initial 'hope' that I could get 25 people interested has become looks like we are going to make at least 50+. That would mean that I would need to have more canvases painted and kits put together for our exclusive design for the optional Class Kit for the cruise. This piece was such fun to stitch and I can't wait to share it with the group. 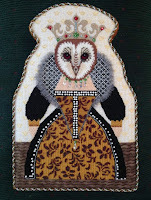 Back in the real world, I just finished packing the kits for the TNNA Winter Market where I will be teaching. It is in San Jose this year so that, for me, is a long flight. I am needing to get together what I want to work on while on the plane and in the terminals between flights since I must always change planes when going to the West Coast - well, actually going almost anywhere from Lexington! 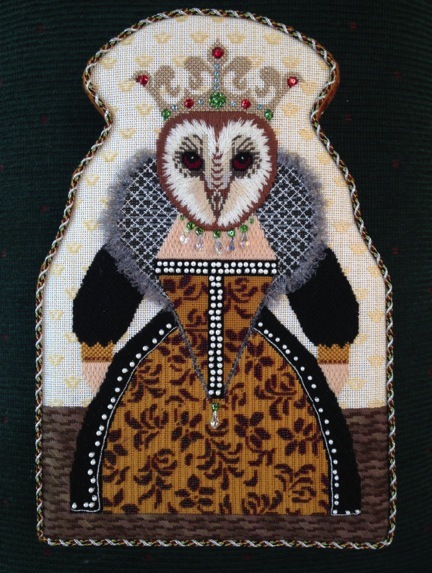 I am also putting together kits for the lovely Owls classes from JP Needlepoint that I will be teaching at the Blue Bonnet Retreat in Austin after I return from San Jose. I am so fortunate to be able to 'work' at what I love to do. That does not mean it is not work and that does not mean that it does not get to be tiring. But, so far, I never 'tire of it'. A very dear friend cautioned me this past week that she feared that I was going to burn myself out. So, I have promised myself that I will start to be much more selective with my choices. I definitely love, love, love the Online Mystery Classes. I have 'met' so many wonderful people. I have learned that this media provides them an opportunity to dip into our world that they may not otherwise have. We are able to reach people that do not have the luxury of shops or guilds or stitching circles that many of us take for granted. That is a wonderful experience. I am amazed at the response for our Stitching Cruise! We have another great one on the sidelines for 2018! And it will likely be in the Fall time period also since this one has been so well received. This has introduced us to a whole new set of stitchers! While many have taken some of my Online Mystery Classes , and a few have been in face-to-face classes, most I have never met but through this Internet process. But, great friendships have developed even though we have not heard each others voices or seen each other in person as yet. It reminds me of the 'Pen Pal' days. Did any of you have a pen pal? It was a method of dreaming and reaching out and touching places and people that we would never be able to see or visit (at least in my neck of the woods and background) or trips that would never come to fruition. That was a time when we had 'imagination' and were required to use imagination to entertain ourselves. I believe that is why I still prefer to read a book first and make my own visuals before a movie comes out and brings to life someone else's imagination. Well, until we all actually meet face-to-face on these adventures we have been working towards for a year or so, how many of us has had fun developing what we think someone is like? We have the secret Facebook Page that is very active. We are interacting with each other and have developed a closeness that is unreal. My participants have the most wonderful attitude and open mindedness! We cannot help but have a wonderful time once we all get together in Milan, Italy. And think how that relationship is going to grow as we travel on down (or is it up) the Po going to Venice and visiting wonderful sites along the way. But until then I can still sit here and wonder 'is Sally short or tall, does Anne have dark hair, what about Jela, her profile presents a beautiful lady, Susan has a lovely smile, is anyone in our group quiet and reserved (lordy help them) because that does not appear to be the case at this point, what about the others that we don't get a sneak peek of them because of a different type profile picture so we cannot develop a fixed image of them? WOW! The non-stitchers will be wondering what on earth this crazy bunch of individuals is constantly laughing about and why are they so boisterous? (Yep, my classes are not quiet!) These are a group of little ole ladies doing their knitting for gosh sakes! Can't you just see the other people on the cruise who do not have a clue as to our craziness! Maybe we can get them to sign up for our trip next year, lol, I LOVE IT! Good gravy, I'm on a roll here - I better quit typing and get some work done. 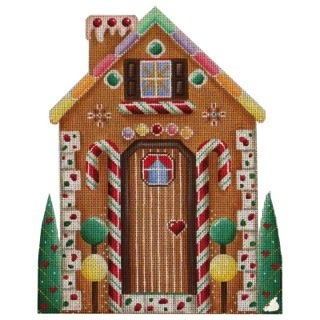 Have a great week and remember to start the year by Stitching With a Smile! Lots of hope and anticipations for the future New Year! Always seems like a fresh start when that number rolls over. Wonder why? It is just the next day on the calendar and yet we approach it with much excitement , hope, reverance and expectations! 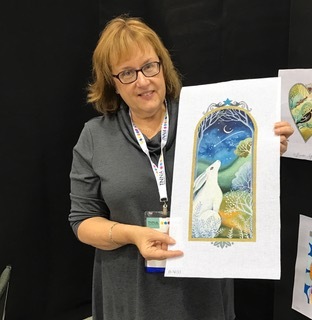 If you are in the market for a wide range of needlework books, be sure too check out Ruth Kern Books at her blog http://ruthkernbooks.blogspot.com/…/december-2016-blog-may Ruth used to host the fantastic book stores for the various Seminars, Regional Seminars, Workshops, etc. She has been tremendously missed at these venues. She does, however, manage to keep us supplied with the new - and the vintage - publications that we all cherish. I am very proud to have headed Ruth's Most Requested Needlework Books of 2016 list (wonder if the fact that my name begins with an 'A' had anything to do with that - LOL). 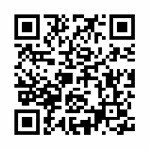 Check out Ruth's website and if you need something in particular give her a try - she is a great detective at finding what seems to slip right by us. Can't leave 2016 without remembering the most requested needlework books of this past year. With all the hustle and bustle of 2016 maybe we should slow down and review what we learned and what we accomplished. Happy New Year! Large Easter Rabbit by Brenda Stofft will have his first session posted on January 15! Only one week away! Wow it seemed like this project was a kazillion years away and here it is! I think I am going to cause a lot of trouble on this one. But wait . . . . 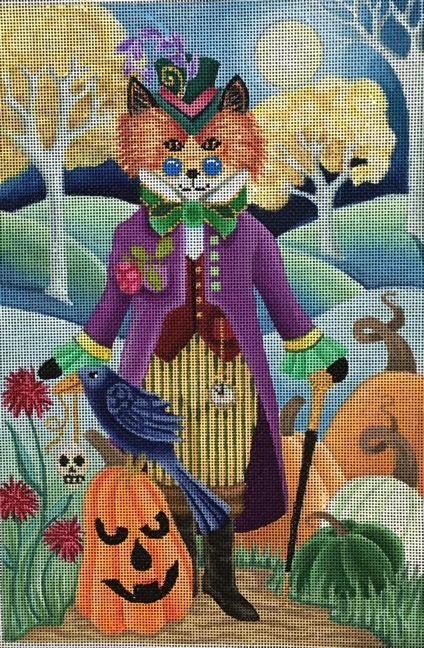 Invoices have just gone out for the 'squeeze me in' design - the Steampunk Fox also by Brenda Stofft. The first session for this handsome guy will be February 15. Oh lordy help us all! 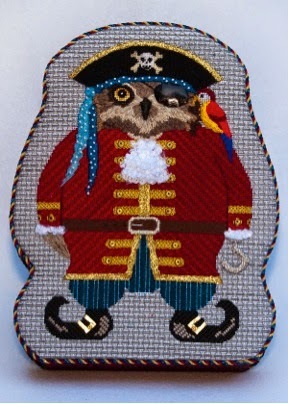 Do you have any idea how many different colors of thread are needed for this guy? What about textures? Look at the various trinkets? Oh my, oh my! Am I in heaven or what? Also, if assistance is needed for gathering materials let us know. 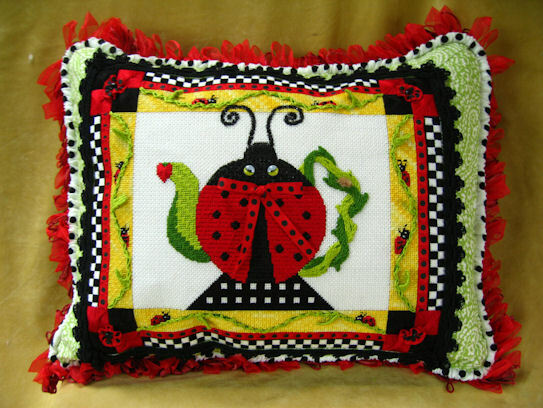 Many do not have local needlepoint shops or shops that have a wide variety of options. There is still time to participate in either or both of these classes. Just email me at duodesignsinc@yahoo.com for details - or take a glance on down this blog to older posts and see the entire 2017 class agenda! We are already sharing Session 3 in the Santa's Rewards Class. Session 4 was very productive. The highlight was giving him reading glasses so he could see our wish list better! Session 5 of Robin's Wreath will be shared on the 15h! In Session 4 we did more spectacular leaves and finished the fruits. In Session 4 of our fantastic Pillow Collage class we really pushed the envelope. Here are some photos of a couple examples of what transpired for that lesson. Whatever is in store for Session 5? Mercy! Yes - 14" x 33" cut canvas size! But packed with so much fun come November! If you wish to review our 2017 Agenda of Online Mystery Classes, scroll down to our posting of December 19, 2016 - they are all laid out for you. We welcome one and all! Love working on the special debut exclusive for our upcoming tour to Boston in June! 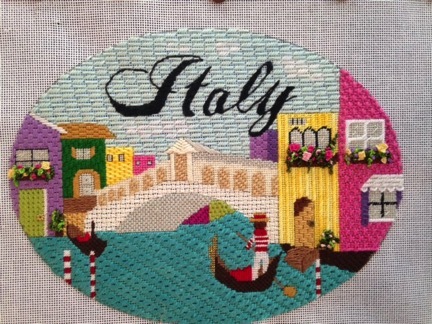 We will be visiting three (3) needlepoint shops as well as seeing all the major sights we should see while there. 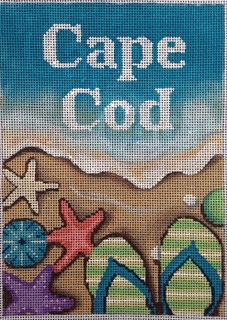 Then we hop over to Cape Cod for our full day, official class created by Osterville Needlepoint! And, as if that wasn't enough, we will have the option of attending a special evening class that you won't want to miss hosted by Joyce of the Osterville Needlepoint Shop. We need to shake the bushes and get more people signed up for this tour however. The agency has a minimum of 20 people in order for this trip to be finalized and we are a few people short! If you want more details and are interested in joining us, check out the full brochure over on the Needles 'N Fins Facebook page (email me for invitation to the closed group), or go to the blog of www.needlesnfins.blogspot.com. If neither of those work for you just email me at duodesignsinc@yahoo.com and I can forward a brochure to you via email. We'd love to have you come play with us. Oh, did I mention that we are having a Pajama Party? Oops! Don't think this one will be appropriate for our venue! Yeah, this is more our style! This stitching riverboat cruise is for those with a more international taste. We have over 60 interested parties of which 43+ have paid! That poor 'Po' River will never be the same. Early booking special expires January 16, 2017 so if you are seriously interested in joining us you might want to start moving! Email me at duodesignsinc@yahoo.com, or contact our Viking Travel Agent Liz at lwolak@vikingtvl.com - you will need to pre-register with Duo Designs to be able to participate in the group but you can get all your questions answered prior to doing so. This is becoming a real fun group and heaven only knows what Italy is facing when we all land! Come join us! 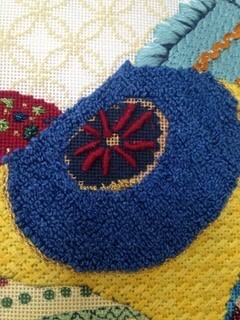 This is a picture of the exclusive design that will be taught as the optional class on the cruise. Happy, colorful and just oozing with memories! Canvases are being painted, threads have been ordered and kit-making is in full swing! There are still a few staterooms left so if you'd like to join us just come on over! 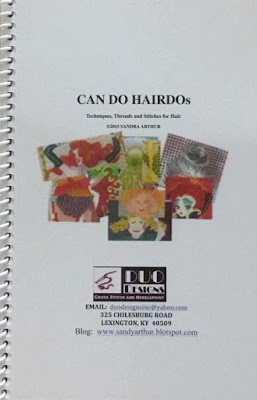 Email me at duodesignsinc@yahoo.com or visit the same sights as listed above to download a full brochure. Viking Travel is handling all the travel details for my group so we are in good hands! Contact Liz at lwolak@vikingtvl.com if you have some travel specific questions.